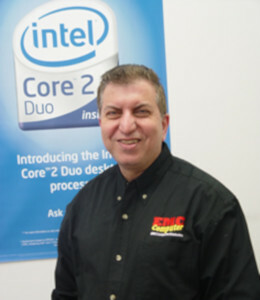 Elie Nicolas entered the computer business world in 1991. After working many years in computer retail management he decided to open his own computer store. Over the years Mr. Nicolas brought new ideas to the computer environment. During 2006 he sensed he was ready to command of his own store to pursue his life-long dream. At the beginning of 2007 he and his business associates signed the company's articles of incorporation. Mr. Nicolas's dream has come true. He will bring a breath of fresh air to computer industry. His good name and business sense will bring take him and his company years down the road with excellent customer service and a top line of product offerings. EMC places a premium on hiring the best and brightest employees. Continually training in new technologies and emerging operating systems, the EMC team's goal is to be recognized as the experts in IT solutions. As a local business, EMC has cultivated strong ties to the City of Troy and the surrounding communities. EMC plans to be integrally involved in a number of businesses, educational and private initiatives. Please give us a call and regarding your next system, accessories, upgrades, IT services and projects. We look forward to a long and happy relationship!